The usage of ritual as a means of communication, worship, and social construction is a ubiquitous element in human societies. In recognition of this fact, the field of ritual studies has expanded in scope and relevance in the last half century. Yet ritual as an important element within the Qur’an is largely unstudied. This post offers preliminary thoughts on the application of theories and perspectives in ritual studies to the study of the Qur’an. The study of ritual within the western academy has developed somewhat in tandem with religious studies, with Myth-and-Ritual, sociological, psychoanalytical, and structuralist schools of thought developing distinct approaches to the study of religious ritual. Since the mid-1960s, ritual studies scholars have come to value more interdisciplinary approaches, and to integrate many different fields—such as sociology, anthropology, religious studies, and cultural studies—into the study of ritual. Some of the most prominent thinkers on ritual in the last few decades include Catherine Bell, Ronald Grimes, Mary Douglas, Roy Rappaport, and Clifford Geertz. Their ideas, methods, and tools for studying ritual should form the basis for any study of ritual within the Qur’an. 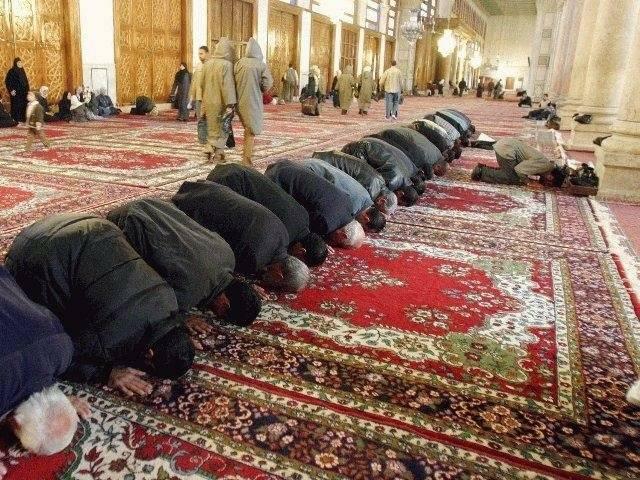 Muslims praying at the Umayyad Mosque in Damascus; photo by Antonio Melina/Agencia Brasil, 2003. For many years, ritual theorists have wrangled over a precise definition of “ritual,” but it is difficult to define because ritual as a category involves human emotions that are subjective and transient, and sometimes defy lingual expression (Muir, 2005, 2). It is also important to recognize that a universal, succinct definition may not only be impossible but also theoretically detrimental to the scholarly study of ritual (Bell, 2009, 82). For this reason, among others, many theorists have moved away from the utilization of strict definitions, preferring to devise more flexible typologies for describing, comparing, and analyzing ritual actions. Some scholars, like Grimes and Bell, go further to simply describe aspects of each ritual as “family characteristics” on a sliding scale of characteristics to determine if something is more or less ritualized. The strengths and weaknesses of these various approaches should be carefully weighed when considering which tools and methods will best fit the analysis of ritual action within the Qur’an. Ritual as a category is most often studied contemporaneously with its performance, whereby an anthropologist or ethnographer views or participates in a ritual and queries the performers as to its meaning and function. And yet, much of the basis for religious ritual performance is found in written texts like the Qur’an. However, depictions of rituals in the texts may differ from their lived performances. For this reason we must differentiate between the study of ritual in Islam and the study of ritual in the Qur’an. The idea that Muslims’ performing rituals in the present can shed light on how and why such rituals were performed at the time of the reception of the Qur’an is an assumption that needs to be treated carefully if not outright avoided. Ritual in the Qur’an must be primarily analyzed in its late antique historical context, which is significantly different from later contexts of Islamic ritual. We must consider the rituals contained in the Qur’an in connection with the religious communities of Late Antiquity, not through a lens of origin studies, but in order to understand the concepts of ritual usage that existed at the time, and the ritual symbolism and action from which they were adopted and adapted. For this purpose, research on the historical context and biblical subtext of the Qur’an—like that of Gabriel Said Reynolds and others—is vastly important. The study of ritual as represented in the Qur’an is necessarily different from the study of ritual as a lived tradition. Researchers on the Qur’an cannot query a ritual’s late antique performers as to its purpose or meaning. They must rely solely upon the written text. At the same time, it must be remembered that written reference to ritual does not constitute ritual itself. Scholars relying on written evidence must also deal with some of the issues that more generally problematize the literary study of ancient texts, including questions of provenance and preservation, as well as the likelihood that a text may not have all the information that one would expect or wish to be present, due to editorial redaction, genre and form, or authorial intent. To help overcome these and other challenges in studying ritual within the Qur’an, one can look to ritual studies as applied to the text of the Bible, including the works of Gerald A. Klingbeil, Mark McVann, Frank H. Gorman, David P.Wright, and Ithamar Gruenwald. Some of the issues identified within the study of biblical ritual apply directly to the Qur’an, while others apply only tangentially or not at all based on the basic differences between the Bible and the Qur’an in terms of composition, canonical development, etc. For example, the compositional character of the Arabic Qur’an—namely, the usage of sajʿ (rhymed prose)—leads to a general lack of prescriptive ritual designations, because detailed instructions about how rituals are to be performed do not appear to fit well within that artistic style. Ritual study of the Qur’an is a wide-open field, with great potential for shedding light on the ways that ritual was understood and used by the earliest community of Muhammad’s followers to express their devotion and worship and to declare, create, and maintain their religious and communal identity. The preliminary thoughts presented above barely begin to tap the potential for greater engagement with this area of research. They are meant to stimulate further thoughts and conversations about the role of ritual within the Qur’an and the discourse of the early community of Muhammad’s followers. * Andrew C. Smith is a Ph.D. candidate in the Department of Religion at Claremont Graduate University. The success of IQSA’s annual meetings in San Diego, CA (2014) and Baltimore, MD (2013) have contributed positively to the tremendous work done every year by both the Society of Biblical Literature (SBL) as well as the American Academy of Religion (AAR). For more information, please see the excerpts below from two articles in Publishers Weekly. The Adyan Foundation, in partnership with the Lebanese American University (LAU), invites papers for a two-day conference on “Religions and Political Values,” to be held at LAU’s Byblos campus, 26-28 November 2014. Responding to widespread interest in a values-based paradigm for engaging religions in the public domain, the goal of the conference is to create a forum for diverse sectors of society to reflect on how political values are defined and activated in Muslim and Christian discourses, and to explore and promote dialogue about these values across diverse worldviews. In so doing, the conference seeks to put recent scholarship in the humanities and social sciences in direct conversation with social-political and scriptural theologies, in Christianity and Islam specifically, and to confront questions and recommendations from public leaders and policy makers. The conference will be conducted in English and Arabic. The deadline for abstract submissions is 1 September 2014. For more details and submission instructions, you can download the full call in PDF here: CFP: Religions and Political Values. * Thanks to Nayla Tabbara, Director of Cross-Cultural Studies at Adyan, for sharing this CFP. 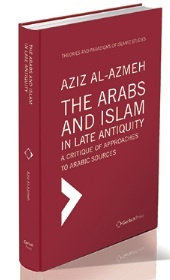 Aziz al-Azmeh’s new book, The Arabs and Islam in Late Antiquity: A Critique of Approaches to Arabic Sources, is a critical study of Arabic textual sources for the history of the Arabs in late antique times, during the centuries immediately preceding Muhammad and up to and including the Umayyad period. Its purpose is to consider the value and relevance of these sources for the reconstruction of the social, political, cultural and religious history of the Arabs as they were still pagans, and to reconstruct the emergence of Muhammadan and immediately post-Muhammadan religion and polity. For this religion (including the composition and canonization of the Qur’an), the label Paleo-Islam has been coined, in order to lend historical specificity to this particular period, distinguishing it from what came before and what was to come later, all the while indicating continuities that do not, in themselves, belie the specificity attributed to this period of very rapid change. This is argued further in Aziz Al-Azmeh’s The Emergence of Islam in Late Antiquity: Allah and His People (Cambridge University Press, 2014), to which this book is both a companion and a technical preface. Al-Azmeh illustrates his arguments through examination of orality and literacy, transmission, ancient Arabic poetry, the corpus of Arab heroic lore (ayyam), the early narrative, the Qur’an, and other literary sources. 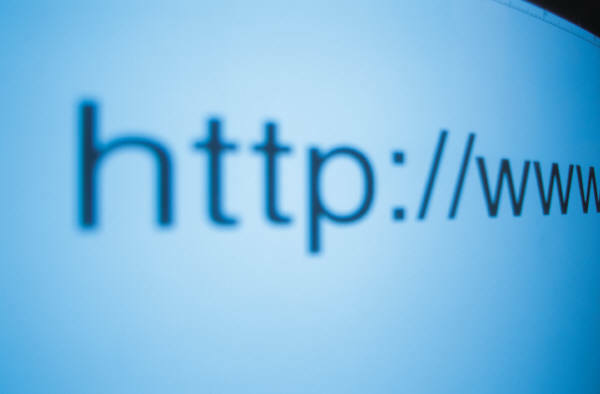 The work includes a very extensive bibliography of the works cited. * This post is based on the publisher’s announcement. The book is the first in the Gerlach Press series, Theories and Paradigms of Islamic Studies. We are now days away from the first Annual Meeting of the International Qur’anic Studies Association taking place in Baltimore, November 22-24. This meeting is very special and would not have been possible without the help, partnership and collegiality of numerous friends. We are confident that you will find the scheduled panels both stimulating as well as enjoyable. For a complete showcase of our events, participants and sponsors we are proud to present the official AM 2013 PROGRAM BOOK. Viewers are encouraged to further circulate the program book. Finally, do not forget our Qur’an Manuscript Panel and Inaugural Keynote Lecture followed by Reception all taking place on Friday, Nov 22 (one day before the official start of AAR or SBL). Our Keynote Lecture is on “Implausibility and Probability in Studies of Qur’anic Origins,” and will be delivered by prof. Aziz Al-Azmeh, with a Response by prof. Jane McAuliffe on Friday, 11/22/2013 at 4:30-5:45pm in Baltimore Convention Center, Rm 345. These events are all FREE & OPEN TO THE PUBLIC. To attend please RSVP HERE or send a message to contact@iqsaweb.org. On behalf of the Directors, Steering Committee and our partners we would like to express our deepest gratitude to all friends of IQSA, and we look forward to seeing you on Friday. 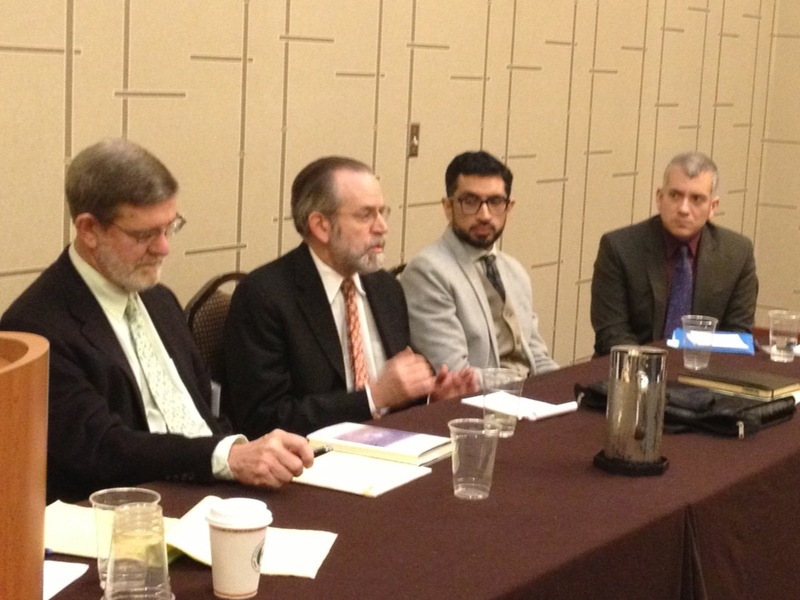 IQSA co-sponsored a panel at the recent meeting of the Southeastern Commission for the Study of Religion (SECSOR), a regional affiliate of the American Academy of Religion, the Society of Biblical Literature, and the American Schools of Oriental Research. The panel, held on March 17, was a roundtable dedicated to a discussion of Carl Ernst’s new book, How to Read the Qur’an: A New Guide, with Select Translations (UNC Press, 2011). Brief comments on Ernst’s book were given by Gordon Newby (Emory University), Youshaa Patel (University of Tennessee Knoxville), and Michael Pregill (Elon University), followed by a response from Ernst himself. In his book, Ernst adopts a literary method of analysis of the Qur’an, emphasizing the evolution of the Qur’anic Suras as moments in a long process of development of revelation to a new religious community. He thus deliberately avoids the thematic treatment of the Qur’an that is all too common in introductory works on the scripture, since this approach places too much emphasis upon the completed, canonical Qur’an as a source of law and theology and often elides the diverse viewpoints and even contradictions manifest in the Qur’an’s message. Utilizing the approach adopted by Neuwirth and others of following the modified chronological scheme proposed by Noldeke in the nineteenth century, Ernst divides his work between Early Meccan, Middle and Late Meccan, and Medinan compositions, paying close attention to the intertextual allusions both to older literature and previous Suras found in each stage of the Qur’an’s development. Gordon Newby began the conversation by noting that he teaches the Qur’an in three different courses, and that Ernst’s approach well complements his own. In his remarks, Newby observed that Ernst’s emphasis on the Qur’anic Suras as an evolving discourse, a “developmental model,” fits well with his pedagogical focus on the multivocality of the Qur’an—its varied, complex, and often maddeningly indeterminate approaches to its subject matter. Cultivating an appreciation for scriptural indeterminacy in students who urgently want to know what the Qur’an “really means” can be challenging, but Ernst’s work potentially offers us substantial assistance in this task. In turn, Patel focused on the questions of both the Qur’an’s audience as imagined by Ernst—likely more plural and ambiguous than later Muslim tradition might have us believe—and the audience of Ernst’s book itself, since the work implicitly seems to be aimed at non-Muslim readers. The Qur’an’s evident familiarity with the ideas and practices of older monotheist communities inevitably provokes the question of the real makeup and presuppositions of its late antique audience. Patel also interrogated Ernst’s attempt to dispel the claim frequently made by Western readers of the Qur’an that the scripture is incoherent and illogical, suggesting that instead of dismissing the idea of the Qur’an’s incoherence, we might rather embrace its use of non-linear argument and presentation of its ideas. He linked this to the experiential reality of the Qur’an as an oral and aural text, which seems like a necessary complement to Ernst’s emphasis on encountering the Qur’an as a written text. Pregill’s remarks focused on Ernst’s methodological dependence on the sira or biography of Muhammad as the ultimate source used by the tradition to establish the chronology of revelation of the Suras. Reiterating the well-established “revisionist” critique of the sira, Pregill speculated that adopting a “Qur’anist” approach to the Suras—which abandons any presuppositions about their developmental sequence—often yields interesting insights; however, without any external basis for proposing an alternative chronology, all such hypotheses must necessarily remain speculative. He also noted that Ernst’s work not only succinctly summarizes the major insights yielded by recent investigation into the Qur’an’s structural reliance on so-called “ring composition” but also convincingly models the use of this technique in an original way, demonstrating for readers how they themselves might use it to execute their own close readings of Qur’anic passages. Ernst’s interest in analysis based on ring composition was driven by the method’s capacity to preserve tensions within Suras. 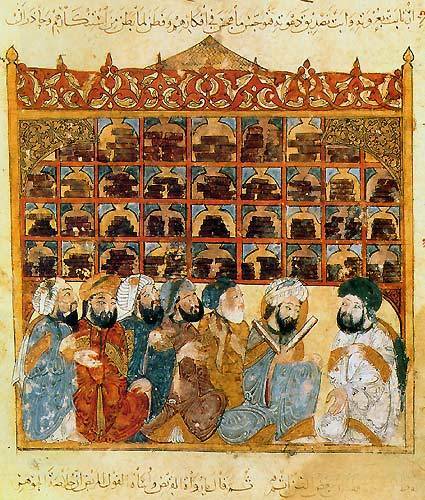 Understanding how the Qur’an deliberately seeks to build a creative tension between historical particulars and moral absolutes by positioning the former at the outer edges of Sura and the latter at the center allows us to recognize contradictions within the text—even, and especially, within individual Suras—as an indispensable aspect of Qur’anic rhetoric. This perspective encourages us to embrace such contradictions instead of dismissing them through the use of abrogation and other interpretive strategies that aim to produce a monolithic, univocal scriptural text. Thanks are owed to all of the panelists for contributing their time and effort to this event; Alfons Teipen, who kindly agreed to moderate the panel; Dave Damrel and Rizwan Zamir, chairs of the SECSOR Study of Islam program unit, who first came up with the idea for the panel; and to all of the attendees. Special thanks are also owed to Erin Palmer (Elon University CAS ’13) for her invaluable assistance as rapporteur for this session.